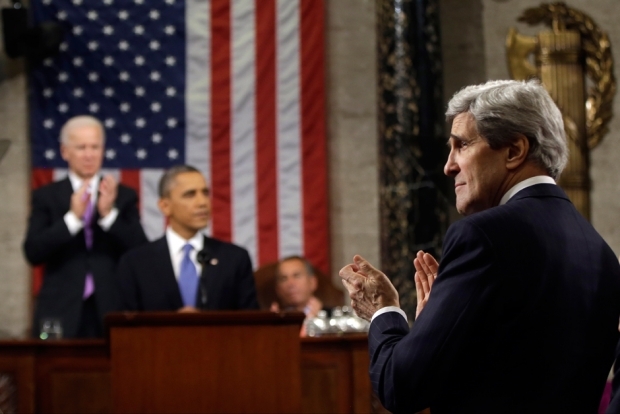 U.S. Secretary of State John Kerry applauds as U.S. President Barack Obama gives his State of the Union address during a joint session of Congress at the U.S. Capitol this week. U.S.-China Tensions: What Must Kerry Do? On a recent trip to China, I heard a lot of scary talk of potential war over the disputed Diaoyu Islands—this from both senior intellectual types and also just regular people, from an elderly calligraphy expert to a middle-aged history professor. People seemed to blame the U.S. for encouraging Japan in pushing its claims over the islands. (The assumption being that the U.S. wants to contain China, to keep China down.) So is war a real danger, and what should the U.S. do to defuse tensions? Two weeks into John Kerry's tenure as Secretary of State, Nina Hachigian, a Senior Fellow at the Center for American Progress, who co-authored The Next American Century: How the U.S. Can Thrive as Other Powers Rise (Simon & Schuster, 2008), argues that there is much to be concerned about in U.S.-China relations. 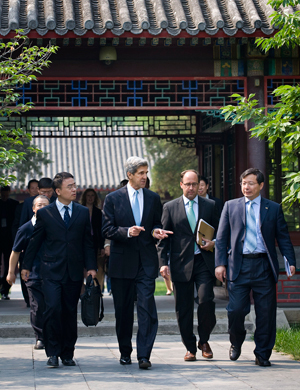 Then U.S. Senate Foreign Relations Committee Chairman John Kerry is followed by embassy staff members upon his arrival at Tsinghua University May 26, 2009 in Beijing. “Beyond the immediate issues, a broader aspect of U.S. policy toward China needs attention: The United States and China have no shared vision for what their future bilateral relationship could or should look like. They have not articulated a clear understanding of how they could continue to co-exist in peace a decade or two down the road, and they need to develop a shared, tangible idea for the future of the relationship. I think Nina is right to identify a lack of shared vision as a serious challenge in the U.S.-China relationship. Unfortunately, I don’t think that at this point in time it is possible to have such a shared vision—beyond what we have always had, namely a stated commitment to peace and stability in the Asia Pacific and to free and open markets. I am fairly sure, for example, that part of our vision for the relationship includes a vastly reformed China (economically and politically)—probably in ways that the Chinese leadership is not interested in reforming, or at least not interested in reforming at the pace we would like. And China’s vision undoubtedly includes some changes in the U.S. role in the world that many here would find unpalatable. In terms of what President Obama or the Secretary of State or Treasury could do within the very real constraints of our two countries’ differing visions and interests, I would suggest at a bare minimum laying out a plan for strengthening our economic relationship. It would be beneficial, for example, for both President Obama and soon-to-be-President Xi to lay out all the advantages that accrue from our bilateral trade to reinforce to people in both countries the benefits of working together. I don’t think either leader does even that much sufficiently. With that as a starting point, perhaps leaders in both countries could establish a two-three year time frame for completion of a bilateral investment treaty and a five to ten year negotiation period for a free trade agreement. We need to appreciate the benefits of the relationship and have concrete objectives for taking it to the next level. To Dinda’s point about the growing talk of war and U.S. containment in China, it is really up to the Chinese leadership to manage this challenge. Frankly, to date, I don’t think that the Chinese leaders have seen it in their interest to dampen this type of rhetoric. In fact, at many points, the Chinese media have clearly stoked nationalism within the Chinese people. Belief within China that the United States is trying to contain China is not a function of the Diaoyu/Senkaku dispute, it is a long-standing, frequently articulated perspective by some segments of society. Even U.S. efforts to work with China on environmental protection have been labeled in the past as efforts to keep China from growing economically. So while I agree that the United States should try to avoid giving substance to the Chinese containment narrative, I don't see this as primarily a U.S. responsibility. Talk is cheap, and in a paradoxical way I think the Obama pivot to Asia — or rebalancing, as the administration preferred to rename it—sends the right signal to Beijing. To be sure, it is hard for any observer — even us, much less policy makers in Beijing—to figure out what American strategy really is. I sometimes even wonder whether it’s possible for a country with two parties that alternate in power, three branches of government, fifteen fairly independent executive departments, and 535 entrepreneurial legislators, to have a coherent strategy. For that very reason, the strategy has to be revealed in practice before can be understood. In practice, U.S. policy since Nixon has been to welcome and even assist in the rise of China. At the same time, U.S. policy has been to maintain and not diminish our longstanding strategic position in Asia—the alliances, the naval presence, the troop deployments, and all the rest. All the talk of war exhaustion, the budget deficit, the fiscal cliff, and the sequester, and of the impact of these things on the U.S. military have understandably led to doubts both here and in Asia about whether the U.S. will continue to sustain its position in Asia. The pivot intended to signal that it would. Time will tell whether it actually does. Either way, the Chinese need to know where the U.S. really stands. It’s understandable that they will test the U.S. in rhetoric and in action to find out where Washington’s bottom line lies. We American observers will find out the answer along with China. I’ve just arrived in Beijing to catch the waning fireworks of the Chinese New Year celebrations, smack in the middle of an interim time bracketed by the two big official congresses, the first held by the Party last November and the second scheduled for the government to make its leadership transition this March. There’s a feeling in the air that big policy issues have been left waiting. U.S.-China relations are among those challenges left hanging. Indeed, with the U.S. election, President Obama's cabinet shuffle, and the ongoing game of musical chairs churning the White House and the Department of State, the same can be said of the climate in Washington. So, Nina Hachigian’s description of U.S.-China relations as lacking any new, clear vision remains true. At the same time, there are areas of worrisome tension growing, especially around maritime issues. Even though Party General Secretary Xi Jinping, China’s next president, has said that he would like to see U.S.-China relations have a fresh start, it is unlikely that there will be a major “re-set” any time soon. Both Beijing and Washington seem far too root-bound by their own issues and inner- and inter-party politics to step out boldly into any kind of new mutual foreign policy framework. However, what can at least happen—and should happen—is an effort by both presidents Obama and Xi to make contact as soon as possible to affirm in a very public way their intentions to upgrade and then carefully cultivate a better bilateral relationship. Simply put, if there are not going to be any big policy framework breakthroughs between the U.S. and China, the very least that we should have is two demonstrable custodians who have been specially designated on both sides to guide and oversee this crucial relationship.